Beasy is one of the industry leaders in contaminated soil remediation. We pride ourselves in our ability to remove contaminated soils, especially friable asbestos soils across the Sydney metropolitan, suburban, and regional locations. With out large fleet of trucks and plant machinery, we are capable of any type of work from small to large scale soil remediation projects. With our team of competent, specialized, and experienced asbestos removal personnel, we always ensure that the job is done correctly and complying to relevant codes of practices and legislations. Clyde Train Maintenance Facility – John Holland – 6900m3 bulk excavations and soil remediation works alongside an operational train line. 11 Fort Street, Petersham – CBC Facilities – Friable asbestos contaminated soils removal to the rear of this facility and associated bitumen works. Sydney Opera House – John Holland – Beasy conducted soil remedation works for the asbestos fragments discovered within the soils underneath the steps of the Sydney Opera House. South West Rail Link – John Holland – Beasy removed asbestos contaminated soils found within the rail corridor of the Glenfield to Leppington railway project. 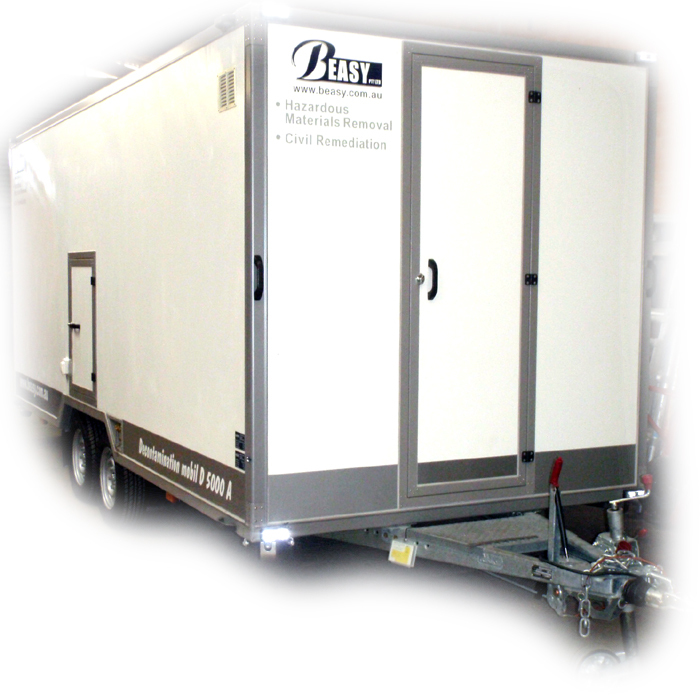 Beasy has multiple state of the art mobile decontamination units that we utilize on all our friable asbestos projects similar to the one below.